Responding to feedback from customers? Proof once again Islam is not a religion but a violent totalitarian political ideology. A bit more islamic education for the masses. Isn't Budweiser sponsoring the thing? Probably best if the saudi snowflakes don't take part at all. Greene King said "feedback" from "some customers in London" alerted them it was "inappropriate"
Ie, 2 people mentioned it on Twitter: one was a snowflake media studies with feminism graduate now working for Islington Libraries and the other was an angry bearded gentleman running a bomb factory of out his bedroom in Ilford. I thought Saudi were going to pull out in protest at the draconian anti-gay laws in Russia. You can get it in any colour you want! During the euros in 2016 a pub in Newry had flags of each of the 24 countries flying outside. It was suggested to them that they may want to remove the northern ireland one. Next day there were 24 guiness flags. Pleased to say the friendly flag of saudi is on display in my local drinkery. Did they end up firebombed by outraged Murphy's drinkers?. Talk about missing the wood for the trees. I'm sure Islam would be pleased to try to get converts from any place, and if a wayward Muslim finds the path because he read the Shahada down the pub then presumably that's a good thing. But football? That's Iblis's game. In football awrahs are uncovered, prayers are missed, fitnah and desires are provoked, and there is the possibility of harm and injury, as well as the negligence of acts of worship. Beyond that supporters treat their team like a deity; all fans are mushrikun. Finally, The nature of this game leads to factionalism, stirring up fitnah and hatred. These results are the opposite of what Islam promotes of tolerance, friendship and brotherhood. I don't see how any of these countries, Saudi in particular, can have anything to do with the game. In fairness tough, they don't allow women to attend. Maybe the words look nicer in squiggly line writing. I "read" that "BBC" "article" and am left "wondering" why they "have" to keep "using" quotation "marks" throughout. Greene King said "feedback death threats" from "some customers in London followers of a particular joyless religion" alerted them it was "inappropriate hurting their feefees" to keep the flag among those from all competing nations. A spokesman for the pub chain said: "To celebrate the World Cup, we have been displaying the flags of the participating nations to promote what we hope will be a great tournament for all. 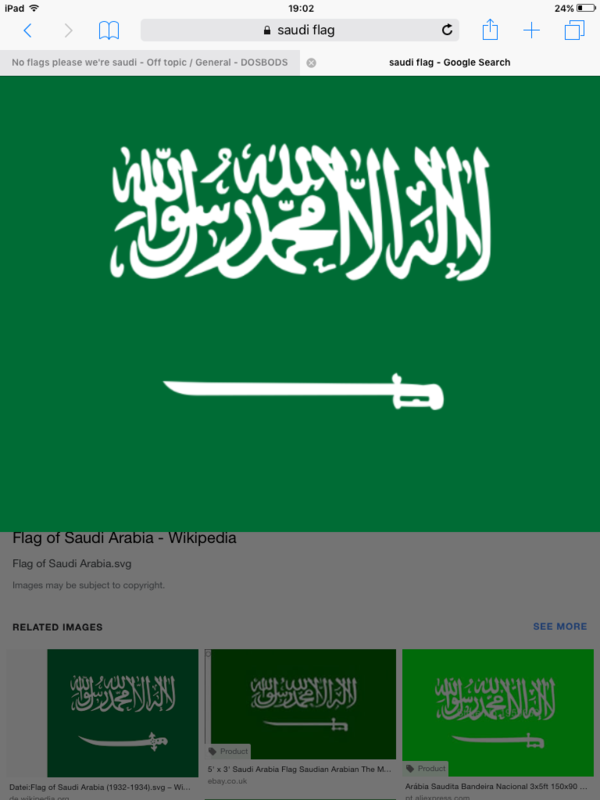 "Following feedback from some customers in London about displaying the Saudi Arabia flag in a pub, we understand it was inappropriate as it contains the religiously-significant Islam Shahadah in Arabic and so we have removed it." Syntax error: Unexpected '"' on line 2.